Bruce Wands (2006). Art of the Digital Age. In 1987, Bernhard Leitner introduced Head Spaces, a series of audio sculptures featuring manipulated electronic sounds that were listened to with stereo headphones. In the same year Lillian Schwartz created Mona/Leo, which proposed the idea that Leonardo had based the Mona Lisa on his own self-portrait. In 1989, Jeffrey Shaw launched The Legible City, an interactive environment in which viewers would use a stationary bicycle to navigate around a virtual city, whose 'buildings' were made up of three-dimensional typography. This was one of the first works of art to explore movement through a three-dimensional space that existed solely within the computer. Educational institutions began to teach computer art on a formal level during this period, and the 1980s ended with the establishment of the first Master of Fine Arts in Computer Art degree programme in the United States at the School of Visual Arts in New York. Books on digital art began to appear. In 1987 Digital Visions: Computers and Art by Cynthia Goodman was published in conjunction with an exhibition of digital art at the Everson Museum in Syracuse, New York. Interest in the digital arts continued to increase throughout the following decade. Computers were now making considerable inroads into creative professions, particularly the field of graphic design. The rapid growth of the internet in the mid-1990s dramatically changed the way in which people communicated and conducted business. The dot.com era not only fuelled the economy, but also introduced new ways in which cultures could interact. A global sensibility was evolving among artists, and the internet was regarded as new creative territory, allowing them to reach international audiences. HyperText Markup Language (HTML) was developed in 1992, paving the way for the World Wide Web. Mosaic, the first example of a graphical web browser, which allowed one to see a combination of text and images while navigating the internet, was released a year later, and the Netscape browser quickly followed. Jodi, the artistic team of Joan Heemskerk and Dirk Paesmans, were among the first artists to experiment with net art. Exhibitions and venues for digital art were also on the rise and, in 1993, the first New York Digital Salon was held at the New York Art Directors Club. Benjamin Weil, Vivian Selbo and Andrea Scott launched äda'web in 1995, an online 'foundry' for artists to experiment with, and reflect upon, the web as a medium. Osmose was produced using advanced technology such as stereoscopic 3D computer graphics, spatialized 3D sound and real-time interaction. Participants wear a head-mounted display and a motion-tracking vest that records their breath and balance, enabling them to experience its virtual space. Composed of ever-changing, semi-transparent elements, Osmose contains a dozen spatial realms, including a forest, clearing, pond and under earth, as well as a substratum of software code and upper area of philosophical texts referring to nature, embodiment and technology. Osmose was the first virtual environment to employ breath as a means of interface, and to use transparency in real-time. Originally designed to run on a large computer, in 2002 Osmose and its successor Ephémère were rewritten to run on a PC. Interactive art using digital technologies became more prevalent during this period as well. Sonata, an interactive cinema work, was created by Grahame Weinbren and Roberta Friedman in 1991 and explored new ways of perceiving cinema. In 1994, Christa Sommerer and Laurent Mignonneau created A-Volve, an interactive real-time environment, while Char Davies explored similar virtual reality environments with Osmose in 1995 (see image at right) and Ephémère in 1998 (pp. 104-05). This was a very fertile time for digital art, as new creative frontiers were discovered and technology continued to develop at an astonishing rate. In 1996, John F. Simon, Jr. unveiled Every Icon (p. 171), which creates random images based on a 32 x 32 pixel grid – the standard size for computer icons. The unique mathematical nature of this work brought considerable critical attention to net art from the larger art community. Simon also challenged the notion of the conventional art marketplace by selling the work on amazon.com. This piece, and other software and net artworks by artists such as Eduardo Kac (pp. 114-15), Rafael Lozano-Hemmer (pp. 204–05) and John Klima (pp. 31, 132), revolutionized digital art and helped establish its reputation among galleries, museums and curators as a serious art form. Fuelled in part by the continued rapid development of technology, at the beginning of the 21st century the general public and the international business community were celebrating the rise of the dot.com economy and an international digital cultural boom. 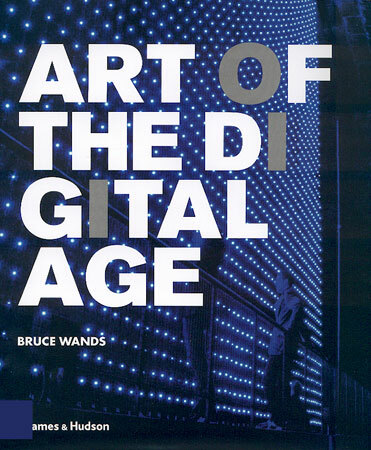 The year 2001 brought attention to digital art through several major museum exhibitions in the United States, such as the San Francisco Museum of Modern Art's '010101: Art in Technological Times'. Including both digital and traditional artworks, the show was conceived as an investigation into the effects of technology on our lives. The 'BitStreams' and 'Data Dynamics' exhibitions, both held at the Whitney Museum of American Art in New York, were significant American museum shows of digital art. New forms of digital art continued to be invented and to push the boundaries of creative expression. Alexander R. Galloway and the Radical Software Group launched Carnivore software, which is based on a surveillance tool used by the FBI to monitor data networks. Innovative forms of performance art also emerged, including Symphony #2 for Dot-Matrix Printers written by [The User]. By creating an 'orchestra' of various printers, these artists had a broad palette of sounds with which to compose. Large-scale light installations included Erwin Redl's Matrix IV (p. 119), which was exhibited as part of the 2001 Whitney Biennial. Database art was also gaining recognition with Pockets Full of Memories by George Legrady (pp. 175-77). This work scanned the pocket contents of gallery visitors and then attempted to identify the objects. Today, digital art continues to flourish in museums and galleries. It is slowly becoming incorporated into the contemporary art landscape, as many of the perceived differences between digital art and contemporary art become blurred. We are in a period of transition: artists of the future will never have known a world without computers, and are unlikely to distinguish between art created with technology and other types of contemporary art. display during live immersive journey/performance. Ephémère is experienced by wearing a stereoscopic head-mounted display and a motion-tracking vest to record the participants's breath and balance, enabling him or her to float through its virtual realms. It is spatially structured along 3 vertical levels: landscape, under-earth and interior body, and also uses gaze to interact, causing elements to respond to the visitor. Each exploration is unique: Ephémère's sounds and visual elements are engaged in constant transformation. They all come into being, linger and pass away in keeping with Ephémère's emphasis on mortality and the ephemerality of life. When exhibited as an installation, Ephémère consists not only of a private chamber for immersion, but also a screen whereby the silhouette of the participant's body can be seen by an audience. This installation design is intended to highlight the significant role that embodiment plays in the subjective experience of virtual space. My goal is to use immersive virtual space to collapse the boundaries between Subject and Object, Interior and Exterior, and Self and Other. In doing so, my intent is to refresh our perception of being in the world. I want to resensitize participants to the extraordinariness of being alive, sentient and embodied, here now among all this, immersed as we are so briefly in the flow of life through space and time. An almost paradoxical relationship exists between installation and virtual reality artists and their studios. Since installation is site-specific and virtual reality is computer-based, to some extent the 'studio' or creative realm of these artists is the public space or cyberspace where their work finds final expression. Installation covers a very broad range of work, and its creators incorporate diverse materials into their art. A digital installation artist's studio will therefore not be radically different from that of a traditional installation artist, aside from the addition of a computer and perhaps some computer-assisted manufacturing equipment and/or an electronics bench. Since the software and hardware used are quite elaborate, virtual reality art is generally a collaborative project between artist and programmer and often involves a larger creative team. Presently, virtual reality hardware and software still remain at the very high end of computing. However, the gap between virtual reality systems and personal computers has begun to narrow, making these technologies even more accessible to artists and their audiences. For example, in 2002, Char Davies ported two of her seminal works to the PC platform from a high-end computing environment. The artists in this chapter represent a broad range of approaches to installation and virtual reality art. Char Davies, a pioneer of this art form, describes her immersive virtual reality environments Osmose (p. 29) and Ephémère (pp. 104–05) as works 'known for their embodying interface, painterly aesthetic and evocation of landscape'. Classics of their genre, they completely absorb the viewer in alternative worlds. Jeremy Gardiner also approaches virtual reality from a painterly perspective. In his Purbeck Light Years (pp. 108–09), the participant uses a video-game engine to navigate a three-dimensional landscape that incorporates the artist's paintings as well as the elements of time and weather. Mathieu Briand's work explores the virtual world through video headsets and transmitters. In SYS*05.ReE*03/SE*1\MoE*2-4 (p. 102), viewers are able to 'see through each other's eyes' by the transmission of a video image from one person's headset to a small screen in the other participant's headset. Grahame Weinbren's installations invite us to explore and to rethink the world of cinema. The viewer is able to interact with the works, which offers a sense of partial authorship during the experience. While Erl King and Sonata are based on narrative, in Frames (p. 1 16) Weinbren invites the viewer to engage with the artwork's characters, who are based on Hugh Diamond's 19th-century photographs of psychiatric patients. While virtual reality and digital cinema draw the participant into the content of the work, other installation artists use architectural elements and public space as the venue for their art. Shih-Chieh Huang constructs environments with various materials, including plastic sheeting, bottles and tubing, and then animates them through sensor-controlled fans, pumps and other electronic equipment (pp. 102, 113). Different lighting schemes are also used to add an other-worldly atmosphere. Erwin Redl uses large-scale light installations as architectural elements with which he constructs virtual reality spaces (what he calls 'reverse engineering'), thus creating the effect of a virtual space without the complex hardware and software interfaces normally required (pp. 119-21). Other artists straddle the borders between print and installation. For example, Diane Fenster prints images on fabric and then creates an environment with these images in a gallery space (p. 106), while artists such as Ian Haig (p. 112) and Federico Muelas (p. 119) build installations in which multiple technologies are employed to engage the viewer. Anticipating the future possibilities of installation art is exciting, as new technologies continue to emerge that will enable even greater control over these created environments. It is likely that wall-size LCD panels will soon be available to artists, as well as other technologies that we have not yet imagined. Irrespective of individual concepts, approaches or techniques, installation and virtual reality are vibrant forms of contemporary art. The digital perspective has brought artists who work in these areas powerful tools and new sources of creative expression. This article may include minor changes from the original publication in order to improve legibility and layout consistency within the Immersence Website.† Significant changes from the original text have been indicated in red square brackets. Last verified: August 1st 2013.